With Easter only a few days away, I wanted to share a modern, but still festive and Easter-appropriate dinner recipe with you today. As I mentioned on Monday, Alex and I are on our own (together) for Easter so we aren't doing anything over the top. I still like to do something special though, so we headed to Chop Shop in Wicker Park and picked up some beautiful lamb lollipops to serve for dinner. 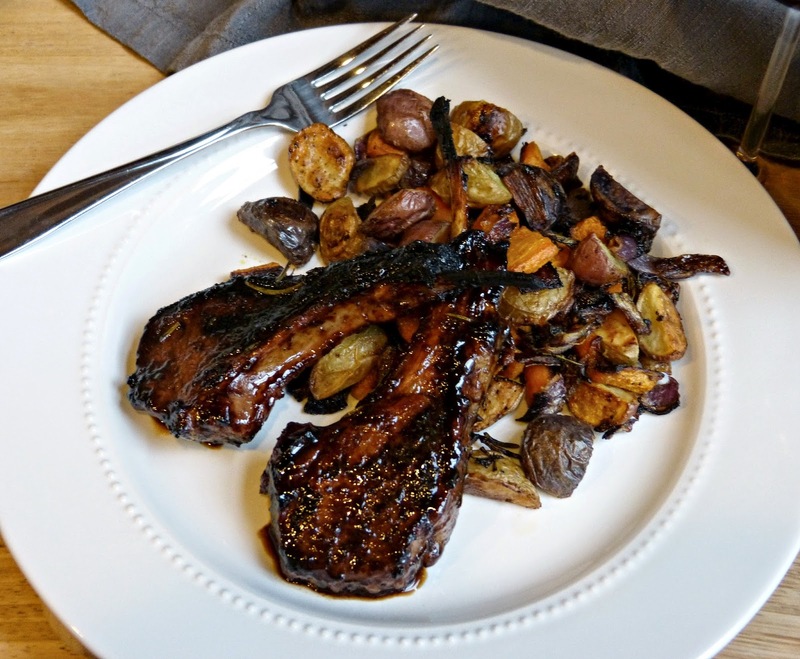 Lamb chops are a perfect way to serve a traditional Easter dinner for just two people instead of the leg of lamb of entire ham that you're probably accustomed to enjoying at the Easter table. Truthfully, this was my first attempt at preparing lamb. I have never really been much of a lamb fan, but recently I have had it at restaurants (here and here) and really enjoyed it so I figured I would give it a go. Since lamb has a stronger flavor, I decided to go with a sweet marinade/glaze combo and then to have Alex prepare them on the grill. I love when a sweet glaze or sauce gets that delicious charred quality on the grill. It's perfect! The lamb chops turned out tender and flavorful. And the glaze is perfect. I combined sweet Valencia orange juice and honey, savory Worcestershire sauce, tangy balsamic vinegar, and woody fresh rosemary to create a complex sauce for the lamb. After marinating the lamb chops in it, the mixture gets cooked down into a syrupy almost barbecue-like glaze that is brushed onto the chops throughout the grilling process. These lamb chops are actually very easy to prepare and you could make them for a holiday, for entertaining, or just for a casual dinner on the grill. I think that the lollipop effect gives them a super fancy feel without a ton of work. 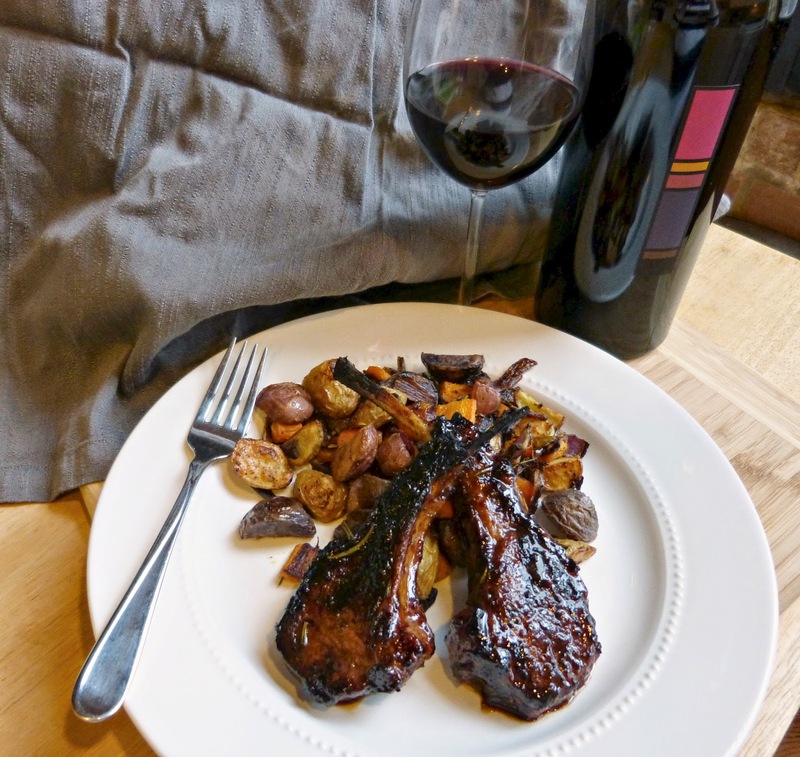 So enjoy these lamb chops on your Eater table or any other warm summer night with a glass of good Cab al fresco! Place lamb chops in a large zip sealing bag or in a shallow glass dish. Season with salt and pepper. In a medium bowl, whisk together orange juice, vinegar, honey, Worcestershire sauce, and rosemary until combined. Pour over lamb chops and marinate for 1 hour. Using tongs, remove lamb chops from the marinade and transfer to a plate. Allow them to come to room temperature for about 10 minutes before grilling. Meanwhile, pour the remaining marinade into a small saucepan and simmer over medium high heat for about15 minutes until thickened. Allow the glaze to cool slightly and set aside. Grill the lamb chops over medium high heat for 10-12 minutes, brushing the glaze on both sides throughout the grilling process. Discard the leftover glaze and serve warm. Inspired by original recipe by Recipe.com. Looking for more special Easter dinner recipes? Try Deviled Eggs, Sun-Dried Tomato & Herb Roasted Chicken, or Individual Easter Ricotta Pies! You shared another good recipe, thank you for helping me with the ideas for my coming party dinner. I am glad you are sharing them right now.